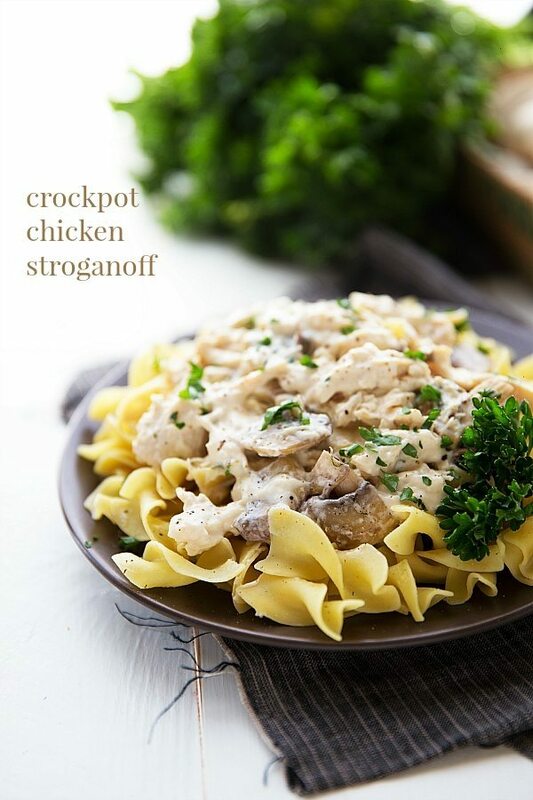 A super simple and well-flavored crockpot chicken stroganoff. 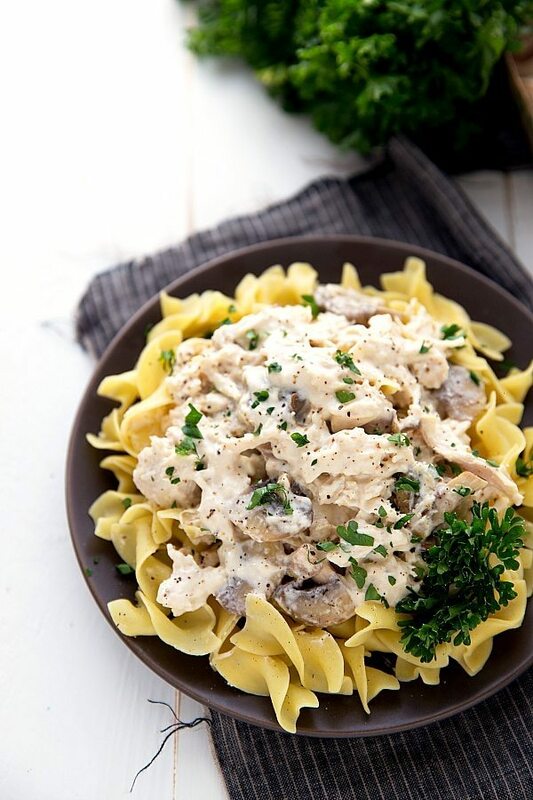 This stroganoff is made without any cream of “x” soups. So guess what?! I’m having baby #2 today! (!!!!) I suppose that is a bit of an abrupt announcement, but I’ll explain. Several weeks back I got transferred to a pregnancy specialist and categorized as a high risk pregnancy due to the baby having what they called growth restrictions. Thanks to lots of awesome doctors and specialists we’ve kept him closely monitored with non-stress tests, lots of ultrasounds, doppler tests, etc. (I’ve been at the doctors almost every single weekday!) Everything has been doing really well with the baby and although he’s been growing slowly, there has definitely been some growth. At my last ultrasound they estimated his weight to be around 4 pounds, 5 ounces. Small baby, but nothing too crazy compared to some of the sizes babies are born at. I’m crazy nervous, super excited, and wondering how the heck I’m going to handle two wild boys. How do I know this guy is wild? He NEVER sleeps!! Either that or he is a restless sleeper because I swear he never stops moving! I couldn’t feel more blessed that I get to have two little boys, but my nerves are definitely a bit on edge. But enough baby talk (I’ll share everything as soon as I can, most likely on Instagram), let’s talk about dinner. Or what should definitely be your dinner!! 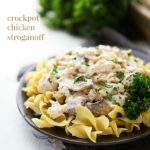 This crockpot chicken stroganoff is crazy easy, ridiculously tasty, and doesn’t require you to use any cream of “x” soups. I’m not a cream of soup hater (I definitely use them every once and a while), but when I have some extra time I prefer the homemade version for control over the ingredients, health factors, and overall taste. And especially when a crockpot is going to do most of my work, I don’t mind whipping together my own homemade cream of soup for it. It does require an extra pot, but it’s pretty quick and simple to do! However, if you want to use the canned version — go right ahead!! I’d recommend using 1 can cream of chicken (or mushroom) soup in place of the homemade version. To cut down on the amount of spices that you would need to track down and/or buy I used an Italian seasoning mix. I love the ease and flavor of the mix, but if you want to do your own mix I’m sure you could search for a recipe for a homemade Italian seasoning mix and then add a few tablespoons or to your taste preference. You may even want more seasoning mix than called for so make sure to taste it out and add if needed! Spray a large slow cooker with nonstick spray. I used a 6 quart crockpot for this recipe. Remove fat from the chicken breasts and cut into large chunks. Place in the crockpot. In a small pot over medium heat, add in the butter. Melt the butter and then briskly whisk in the flour until a thick paste forms. Continue to stir for about a minute. Slowly stir in the chicken broth whisking constantly until smooth. Then whisk in the milk stirring constantly. Reduce the heat and allow to simmer and thicken. Pour the thickened mixture in with the chicken and stir everything together. Shred the chicken and stir everything together. Cube the cream cheese and add to the slow cooker. Allow the cream cheese to melt over the chicken. Stir until completely combined. Stir in the sour cream. Add salt and pepper to taste. Increase any spices to personal preference. 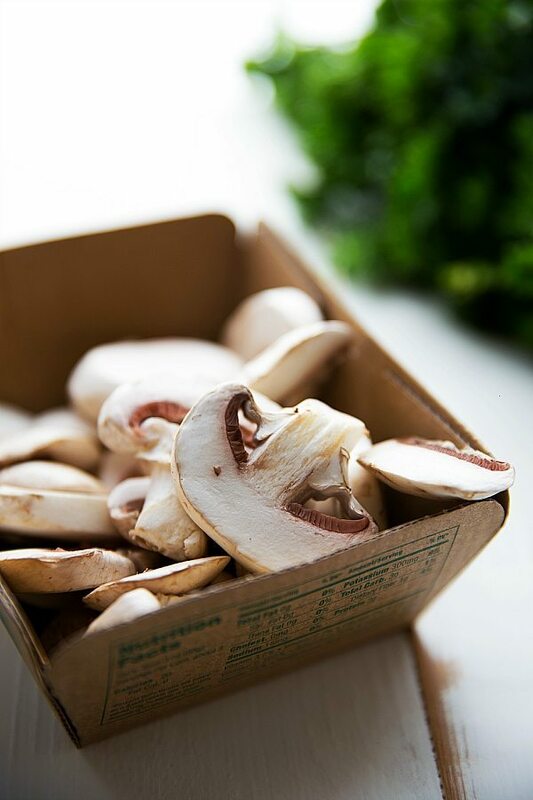 Garnish with chopped fresh parsley or a sprinkle of Italian seasoning. That’s so exciting, Chelsea! Sending all of my positive thoughts your way so that everything goes well. And this dish looks amazing! I love beef stroganoff, but have never had a chicken version before. Sounds fantastic! Blessings on you all. Congratulations. I’m sending my best, excited, happy thoughts your way! I myself have two wild boys and though it’s a lot of work, there’s no better adventure. Welcome, little one! What?! So exciting! I hope everything goes well and you post pictures soon! Congrats! I just saw on Instagram that you had your baby and all is well with you guys. I am so happy for you especially because I am pregnant as well (5 months) and I know how wonderful is to carry a baby inside of us. Your baby is so cute just like your other son. You have a beautiful family, dear Chelsea. Please keep us posting! Have a wonderful Sunday! Congrats on the birth of your little boy, Chelsea, and Im glad everything worked out for you! If anybody can juggle a blog and 2 wild boys, it’s you. 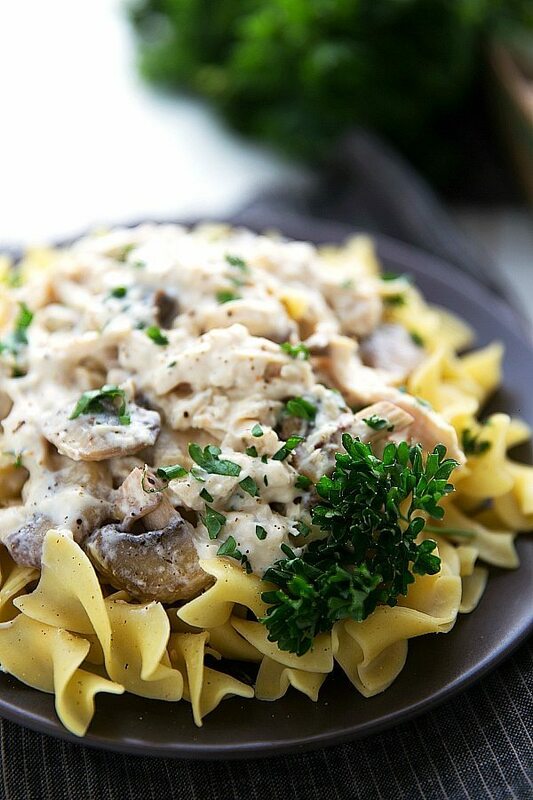 🙂 This stroganoff look delicious and I love that it’s made without condensed soups! awwwww congrats on your new lil fella!!! and omg this recipe is fantastic-perfect for a weeknight dinner! Prayers ascending that all goes well. Love your blog! Great recipe ideas. I hope you love it! 🙂 Thank you so much Barbara! This was delicious!! It was one of the only non-canned soup recipes I could find. I added mushrooms (baby portabellas) and chopped onion as suggested and it was super tasty! I also subbed the sour cream for greek yogurt and it still tasted great. I also used some homemade turkey stock I had on hand since I didn’t have chicken which I think made it a little more rich 🙂 I know this is super late now, but congrats on your new little one too! This recipe has become a nearly weekly event because we love it so much. And, I found it by googling chicken stroganoff no soup mix recipes. So fabulous. Thank you for sharing! Hi, Great recipe – is it double-able? What is the nutritional information on this dish? Looks good. I’m cooking the Crockpot Chicken Stroganoff right now. Your recipe called for 2 & 1/2 Tabledpoons of Italian Seasoning/dressing mix. My G. S. Italian mix packet only contained 1 Tablespoon + 1 & 1/2 teaspoons of the seasoning. Could the recipe mean teaspoons instead of Tablespoons? Thank uou. 1 packet will work great 🙂 Enjoy! What do you mean by Chicken Broth?